AC Modeling | Matcor, Inc.
MATCOR provides a full range of AC Mitigation capabilities including AC Modeling and Design engineering services, supply of our proprietary Mitigator® engineered AC grounding system, and an entire construction services organization capable of a wide range of AC Mitigation installation services. Two current projects highlight our construction service capabilities with regards to AC Mitigation. 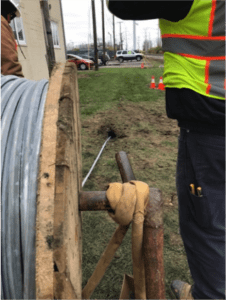 The first project involves several miles of zinc ribbon installation for an AC mitigation system in a congested suburban and urban environment using horizontal directional drilling (HDD) equipment. 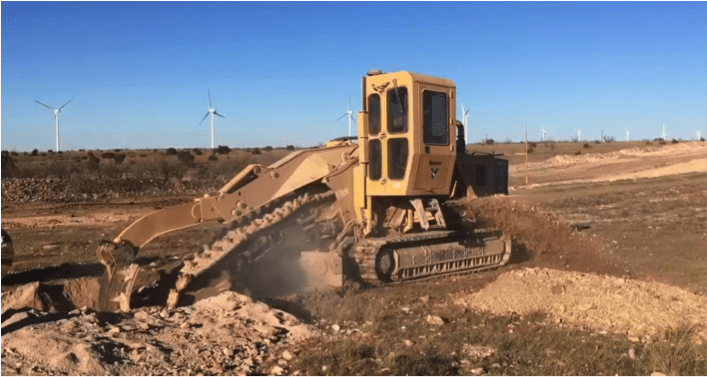 The second application is in a highly rocky environment in West Texas that requires the use of specialized rock trenching technology for zinc ribbon installation. 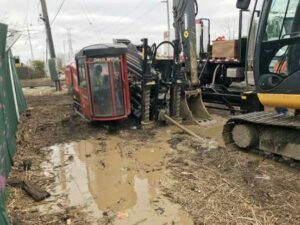 This project in northwestern Ohio involved the zinc ribbon installation over several miles using one of MATCOR’s in-house horizontal directional drilling crews. The project required horizontal directional drilling to minimize surface disturbances due to the congested area. With any typical AC Mitigation installation there are numerous precautions that must be taken to assure a safe installation. This starts with a thorough pre-construction safety review to develop the project site-specific health and safety plan. Each crew member participates in a daily safety meeting to review the day’s planned activities and address all safety concerns in advance of performing any work. Each crew member is required to have the appropriate operator qualifications and site-specific safety training as identified by MATCOR and the pipeline owner. Prior to any other construction activities, the first task is to perform a thorough line locating including potholing (excavation of the top of the pipe). This is to physically assure that the location of the pipeline(s) being mitigated is accurately marked to avoid any risks associated with construction activities in close proximity to the pipeline. As with any construction project, logistics and project management are key to the successful execution of the project. Working in conjunction with the owner and their designated project inspector to assure that the work is performed safely and in accordance with the AC Mitigation design requirements. For the project in Ohio, some additional complications included difficult weather conditions and working in close proximity to a railroad which requires additional permitting and coordination with the railroad. In some locations, traffic control was also required during the installation work. Another project that MATCOR is currently completing involves the installation of approximately 15 miles of zinc ribbon in West Texas. The original installation plan called for the use of a cable plow to install the zinc ribbon mitigation wire; however, for large stretches of the installation, the rocky conditions forced MATCOR to switch from the planned cable plow to a high-powered rock trencher to cut through the difficult rocky terrain. This project illustrates the importance of using the right equipment to overcome difficult installation challenges. In some cases, being able to adapt to adverse conditions requires a change in construction methodologies and for this project, MATCOR’s ability to react and make equipment changes allowed the project to proceed on schedule with minimal customer impact. This project also requires the use of HDD for one specific mitigation segment, as the pipeline traverses a cotton field which includes a buried drip irrigation system. The use of HDD is required to prevent any damage to the drip irrigation system during the AC Mitigation zinc ribbon installation. Coordinating the installation schedule around the cotton crop cultivation added another logistical challenge to the project. Whatever your AC Mitigation challenge might be, MATCOR’s construction teams are able to work with our clients and their project needs to assure a safe and cost-effective installation project. Have questions about zinc ribbon installation, or need a quote for AC mitigation materials or services? Contact us at the link below. We’ve talked about AC Interference and we’ve talked about AC Modeling. The topic of our newest training video is AC Mitigation. The video is about 9 minutes long and we’ve included timeline indicators below so you can easily find your topic of interest in the video. We use AC modeling to provide predictions and look at the mitigated and unmitigated conditions. Some cases warrant building a model, in other cases we can use “ad hoc” methods (such as experience) to come up with an effective AC mitigation plan. Learn more in our AC Modeling Video. For our example pipeline application, AC modeling results show some locations to be concerned about where the 20 amps per square meter threshold is exceeded. These locations are indicated below, where the red line is above the yellow 20 amps per square meter reference line. What do we do to mitigate this risk? In this case, we’re going to put in a gradient control line in the areas of concern next to the pipe. This is a grounding system that attaches to the pipeline so that AC being picked up by the pipeline has a place to go. The coating system is “too good” with only a few small holidays, which means all of the current being picked up tries to rush out of those few small holidays. This is how you end up with AC induced pipeline corrosion. By putting in a grounding system at strategic locations along the pipeline, we can reduce the AC voltage being picked by discharging it and giving it a place to go. There are several ways to design an AC mitigation system but they are all basically grounding systems. 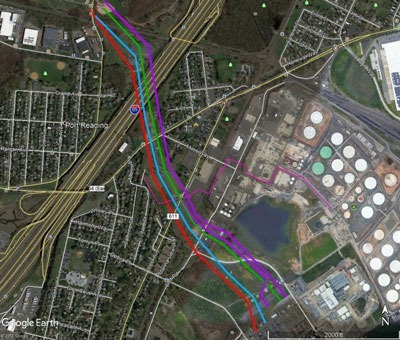 Our solution in this case is shown as the blue line representing a grounding mitigation line. A gradient control mat is a simple device that is connected to the pipeline to protect workers from step and touch potentials. It is connected to the pipeline appurtenance where a person can touch the pipeline, and extends out enough so that somebody standing on it will not have that step and touch potential. Since it is connected to the pipeline, the entire gradient control mat has the same potential as the pipe. As soon as I step on to that gradient control mat, I don’t have a voltage difference between me and everything else. Even if I touch the pipe, the ground below me is at the same voltage as the pipe, so no current flows through my hand, to my body and into the ground. It is a fairly significant effort to install a gradient control mat but they protect people close to that appurtenance. Once they are above that gradient control mat, touching or being near the pipeline is not going to cause a problem. Current doesn’t flow unless there is a voltage difference. You can actually be in an environment where there is high voltage all around you, and as long as you are at the same potential (or equipotential), there is not going to be any current flow, and current is what can injure or kill you. In the case study shown, a pipeline runs parallel for 8 km to a transmission line, with the towers next to the pipeline. In this case the towers are too close so we use a zinc ribbon shield wire to protect from fault conditions. The zinc ribbon picks up the current and dissipates it before it can cause damage to the pipeline. The chart below shows the effects without any mitigation, where you can see the voltage spike where it goes above 12000 volts of coating stress voltage. You can see once various forms of mitigation are added, stress voltage drops below the limits. And depending on the type of coating, there’s a certain voltage limit that coating can withstand. Deep anode ground beds are a little more expensive, however they a good solution in high resistance areas where you can’t discharge current into the ground effectively near the surface. 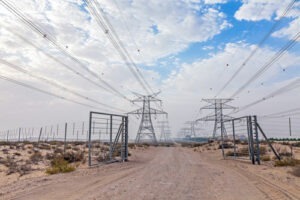 We did a project out west in the desert of the United States, where a new pipeline parallel to a transmission line was picking up AC voltage. In the very dry desert environment there was nowhere for this current to discharge. Grounding rods next to the pipeline do not work well in this case because the environment is so dry. We drilled holes 1000 feet into the earth and installed grounding cells. These were run up to the surface and connected to the pipeline to dissipate the AC voltage being picked up. [7:11] There are a variety of ways to ground a pipeline; AC mitigation is basically how we ground the pipeline effectively. Have questions after viewing our AC mitigation video, or need a quote for AC mitigation materials or services? Contact us at the link below. In this video training session we talk about AC modeling. The summary below includes video timeline indicators so you can easily find your topic of interest in the video. In some cases you can do a best guess AC mitigation approach, where it might not be worth the effort to put data and information into a model to determine the impact of AC interference on the pipeline. Example: You have a simple application where you have one mile of pipeline collocated with high voltage transmission lines. You have measured that you’re picking up AC and decide that you’re going to put grounding in from point A to point B and be done with it. It is over-designed, but the cost of AC modeling would exceed the cost of this simple solution. This approach is based on experience in the field. When you get into more complex pipeline arrangements—multiple pipelines in the same corridor, multiple AC transmission lines coming in and out, multiple towers and circuits—you cannot just throw grounding in the earth and hope it is going to work. You may ground it in one location, and it may push the current somewhere else. In these cases you need to consider AC modeling. AC modeling is data intensive. And just like any model where we use a computer to predict what’s going to happen, the quality of the data impacts the quality of the results. At MATCOR, we use a program called Right-of-Way Pro, a software package developed by Safe Engineering Services and Technology out of Canada. It is the leading AC modeling software available today. There are other packages that are less expensive and less accurate, but Right-of-Way Pro is the gold standard for AC modeling software. AC modeling is a service that MATCOR provides. We have trained professionals with years of experience modeling AC systems in the pipeline industry, and experience with this complex software. First, we calculate the fault condition stress values. What is the worst fault condition that can occur? What is the worst that can happen at each tower and how does that affect the pipeline given the relationship of the pipeline to that tower? How far away is it? How deep is it? What is the resistance in that location? We model every tower along that collocation. Next, we calculate induced voltage. This is the impact of having an electrical field with the pipeline running through it and picking up voltage. We model this for every collocation. This can get rather complex when you have multiple pipelines and multiple AC towers in the same corridor. Then, we predict the AC current density along the length of the pipeline. In the AC Interference video we talked about AC induced corrosion being a function of how much current is being discharged off small holidays. There is a certain threshold we do not want to exceed or we will be concerned about corrosion occurring. The model of the pipeline will show where it is picking up current. At every point along the pipeline, the model indicates, given a holiday of a certain size, whether we have a problem with AC corrosion. This will change depending on where we are along the pipeline collocation and what the soil resistivity is around the pipeline in that location. Lower soil resistivity tends to mean higher current discharge, and these tend to be the areas of concern. Finally, we evaluate mitigation measures. Where should we put mitigation, how much mitigation, and how effective will it be? As we are calculating induced voltage along the length of the pipeline, we are looking for areas where we exceed 15 volts because this is a safety concern. We are also looking for areas where a 1 cm² holiday would have more than a maximum threshold of current density. 20 amps/M² is a typical threshold in the US, since that is where corrosion can occur. We need a lot of data to build the model out, including data on the HVAC transmission line, the pipeline location and characteristics, and the soil resistivity. In addition, we need information about changes in the collocation relationship. These changes are called excitation points; if there is suddenly a change in the pipeline or the high voltage power line, it is often a hot spot in the system and where you will likely have problems. For the HVAC line we want to know the tower geometry, which can change. How high are the towers? How long are the spans? What is the separation of the different phase conductors? AC is always a 3-phase system, with an A, B and a C line. We need to know if there are phase shifts and where they are located for the model. We also need to know the phase conductor arrangement, the conductor height and distances, if shield wire* exists, and current loading information. What is the average current flowing through that line? What is the maximum, or peak current expected? Is there anticipation that the rating will increase in the future? Finally, what are the fault and ground fault currents? *Shield wire helps in fault conditions; if there is a fault, instead of dumping current to the earth it will travel along the shield wire. (8:08) Collecting HVAC line data can be a challenge. It is often a combination of going out into the field and physically measuring, and contacting the power company to request information like maximum fault conditions, length of maximum fault, and how quickly will breakers trip to clear a fault. Power companies don’t always like to provide this information and will often ask operators, or consultants like MATCOR, to pay a fee. When this information is not available we sometimes make assumptions, however the more assumption we make the less valid the model becomes. We want to know pipeline characteristics, which are generally easier to get. Either they are easier to measure or the pipeline company has good data already. We need to know the pipeline diameter or diameters, as sometime this can change. A 16-inch pipe may become a 20-inch pipe at some location. This would be an excitation point because a change has occurred. What is the wall thickness and material? What is the coating type, thickness & quality? What is the coating conductance? (9:52) If your pipeline has an older coating, you probably do not have a big AC problem. If you have a brand-new, high quality coating means you probably have a bigger AC problem. Depth of cover survey—how does the pipeline change its depth relative to the earth? We need to know the accurate GPS centerline of the pipeline in addition to the location of valves, casings, bonds and foreign pipeline crossings. Finally we need to know soil resistivity at different depths and multiple locations along the pipeline. The AC modeling software has the ability to look at multiple layer effects of the soil. All of this data must be collected and put into the model. Often the pipeline company can provide the data or we can go out and measure it. For a relatively simple collocation, you may not need to perform AC Modeling. A very simple AC modeling job might be $20,000. The cost can be well over $100,000 for a project requiring a lot of data collection and modeling effort. In some cases it may be simpler to put in $10,000 worth of grounding and “overdesign” the AC mitigation system since the cost of modeling would be greater. In other cases, AC modeling is an absolute necessity. The output from the software shows you along the length of the pipeline, those areas where you have concerns about steady state touch potentials, from a safety standpoint where it might be above 15 volts. It will also provide your 1 cm holiday leakage current density, indicating areas where you are at risk for AC induced corrosion. In addition the software provides areas where fault currents can exceed the maximum allowable for your coating stress. In our next segment we will talk about AC mitigation. What do you do once you know where the problems are? Have questions after viewing our AC modeling video, or need a quote for AC modeling? Contact us at the link below. AC Modeling enables pipeline operators to evaluate and plan for mitigating AC corrosion. There continues to be much greater awareness by pipeline owners and regulators of the adverse interactions (AC Interference) that can occur between buried pipelines and above ground high voltage AC transmission systems that share some parallelism in a common right of way. When AC Interference conditions exist, it is important that the potential impact is evaluated and when necessary mitigated. For many applications, the most cost-effective approach to assess and mitigate the impact of AC Interference is to use a complicated computer AC modeling program. The term AC Modeling really covers multiple modeling evaluations, as an AC corridor can often be quite complex. They may include multiple HVAC transmission systems and multiple pipelines in a common corridor or multiple shared right of ways along a long length of pipeline. Each may require its own AC modeling. In addition, the modeling looks at several different risks assessing how the pipeline is affected by steady state AC induced current, the impact of fault current along the pipeline and an evaluation of the impact of a fault current on above ground appurtenances to assure safe operation in accordance with IEEE std. 80 step and touch potential criteria. Thus, it is very important for any successful AC modeling effort that the modeling software be of an extremely high quality and capable of properly handling the complex interactions of these various networks. The engineer or technician developing the model must also have sufficient experience and expertise to properly configure and operate the model, and evaluate the results. Electrical data on the Transmission Line(s), including peak and average AC Load (in each direction), fault current max and duration. GPS location, depth of cover, coating type, coating resistance, pipeline diameter, pipeline wall thickness, location of all above ground appurtenances, location of all CP test stations and bonds to foreign structures. Detailed soil data at multiple depths along the length of the pipeline, location of any crossings, presence/location of any foreign CP Stations or other interference conditions. Collecting all the appropriate data often requires some field studies and working with both the pipeline owner(s) and the transmission line operator to get the required data. In some cases, the modeler cannot get all the required information and must make an educated guess – the accuracy of which can affect the quality of the results. Once all the data is collected, the modeler creates the model space, detailing all the pipelines and HVAC systems and providing the requisite parameters associated with each of these elements. 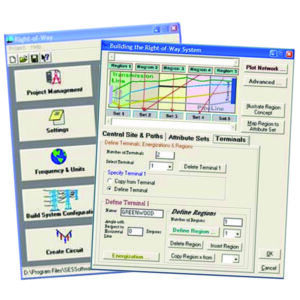 There are several commercially available AC modeling software packages that each have their own format for inputting the pipeline, transmission and environmental characteristics. Once the model has been built, it can take hours, days and in some cases weeks, of processing time to run simulations and for the model to provide the results of the simulation. For any given application, one or more of these criteria may be exceeded along the model’s area of analysis. Once the initial unmitigated results have been evaluated against the criteria that has been established, the modeler then adds, based on their experience with these systems, a mitigation scheme to the model with grounding at selected locations. This is often an iterative project where the model is run and the results evaluated and then if necessary, additional mitigation can be added or excess mitigation can be removed and the model rerun again in search of an “optimized” modeling solution that addresses all of the threats and results in meeting the requisite criteria. Once the AC modeling effort has developed a solution, the modeler develops a final report. Typical components of a final report include an introduction detailing the scope of the study, graphical illustrations of the pipeline(s) and transmission line(s) overlaid onto a satellite image, description of the modeling software used, detailed graphs/charts showing the results of the modeling, detailed drawings and bill of materials for the AC mitigation solution being recommended and appendices with the underlaying data. AC Interference issues can be quite complex and modeling often offers the only valid way to assess and mitigate the risks from AC faults and steady state induced currents. When considering AC modeling it is important to look at the model being used and the modeler performing the evaluation. Questions about AC interference, modeling or mitigation? Please contact us at the link below. Our experts are happy to help.